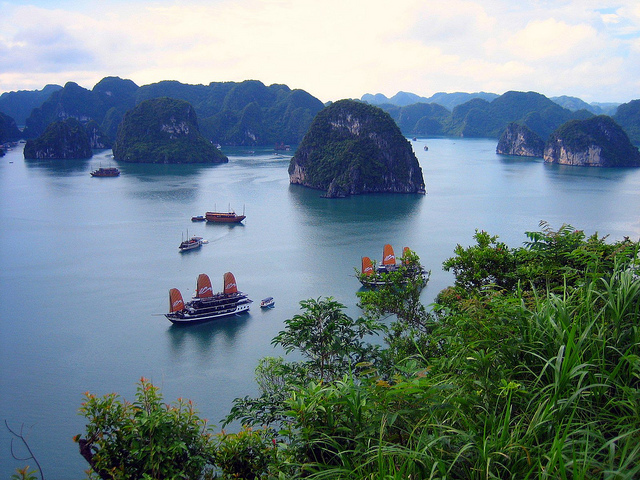 Rising over the serene emerald-green waters of Vietnam’s Gulf of Tonkin, the 3000 limestone islands of Halong Bay are breathtaking. In the summer when the skies are clear, the light plays off the arching cliffs in an ever-changing display. And during the cooler months, the bay is most often shrouded in a mystical blanket of fog. 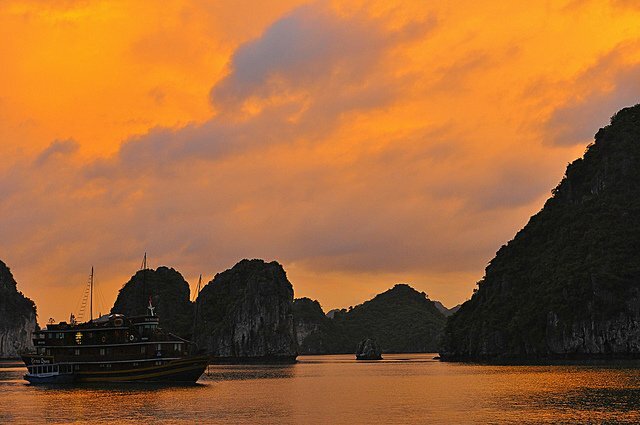 Halong Bay was named a world heritage site in 1994, and it’s easy to see why. 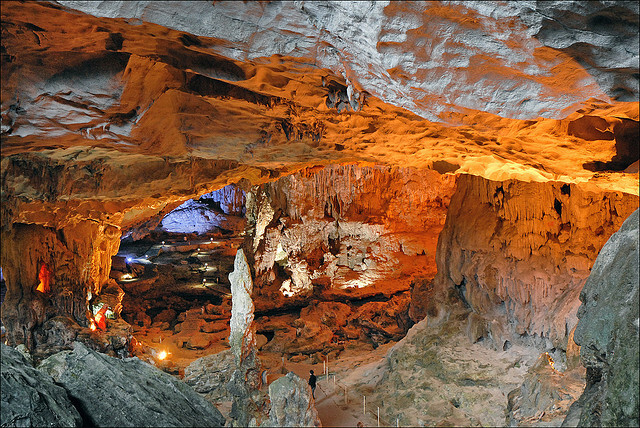 The ancient, wind-eroded islets and the many caves and grottoes dotting this mysterious landscape make it truly unique. It’s an amazing, once-in-a-lifetime opportunity to explore traditional Vietnamese culture in a mind-blowing environment. Legend has it that this incredible scenery was created by a family of dragons who came to defend locals under attack by invaders. The jade and emerald boulders the dragons spewed at the enemy turned into the thousands of islands in the bay. 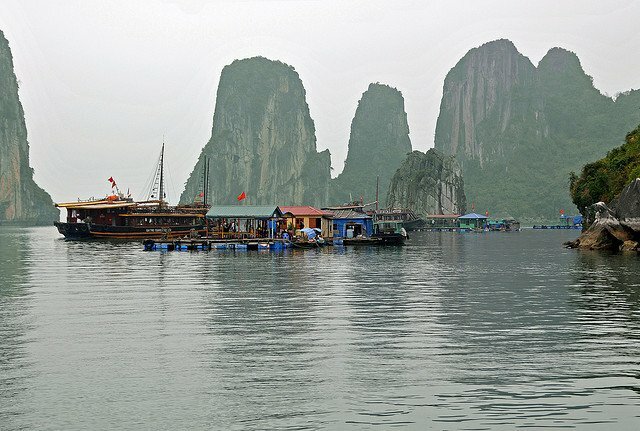 The best way to soak up the peaceful mystic vibe of Halong Bay is to spend some time here — 3 days and 2 nights on a boat in the bay is about perfect. This isn’t the place to look for bargains, though. Luxury options are far better than their cheaper counterparts, and you’ll be glad you spent the extra money. Spending a few days on the bay will also give you the chance to sail those glassy-smooth waters, see traditional floating villages that are only found in Southeast Asia, and tour the area’s many caves. 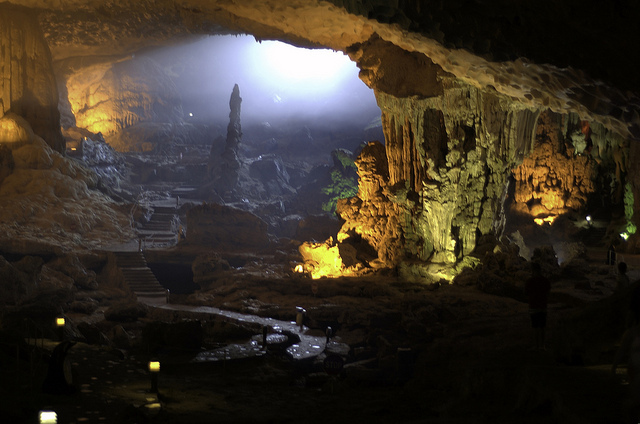 The most impressive cavern by far is Surprise Cave. This massive two-chamber grotto features a clear pool and a strangely mountainous landscape at its deepest point, and fabulous stalactite and stalagmite formations throughout. Flocks of birds often visit Surprise Cave to feed on the fruit of banyans and fig trees that grow inside — and occasionally there are visits from local monkeys, too. Want to get up close and personal in this amazing environment? Rent a kayak and spend a few hours paddling the gentle waves. Guided kayak tours will take you around the bay to Cat Ba Island, where a contemporary shoreline of hotels sits back-to-back with some of the most Jurassic Park-like jungle you’ll ever experience. Almost half of Cat Ba Island is a protected national park, with subtropical hill forests, coastal mangroves and freshwater lakes, coral reefs, waterfalls, and lots and lots of birds. For the real thrill-seekers, kayaking Halong Bay also provides the opportunity to do some serious rock-climbing — straight from the water. You’ll want to be super careful, though. 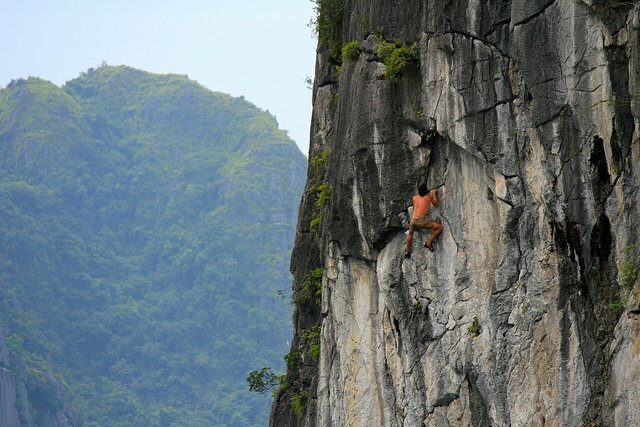 Rock-climbing is a very new sport in Vietnam and this is challenging deep water solo climbing, so find a guide in Cat Ba before you set out on your rocky adventure. 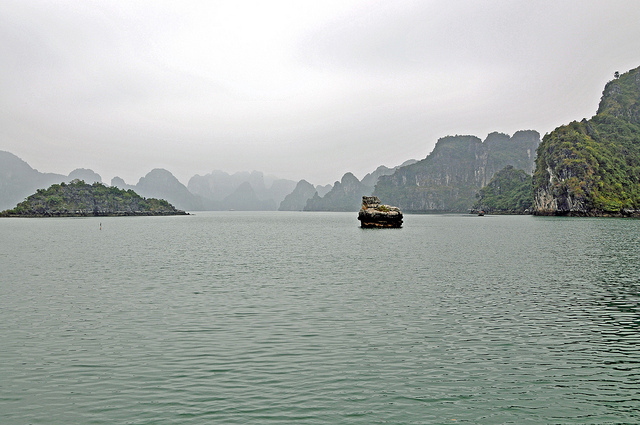 The weather at Halong Bay offers a few challenges of its own. May through September, the skies are generally clear and the views are spectacular. But this is also high season for tropical storms, and a big one will cancel your plans. Conditions are cool and misty February through April, and heavy fog often obscures the dramatic vistas — but it also adds an ethereal look that has its own charms. 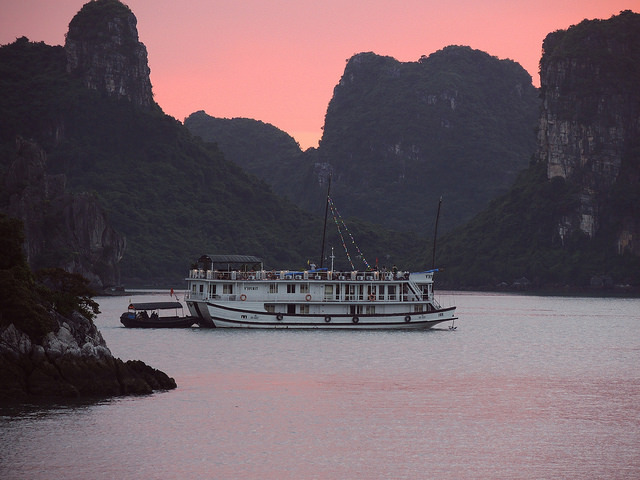 Whenever you decide to visit Halong Bay, it’s a good idea to find out your tour company’s policy on refunds — some will provide refunds when tours are cancelled due to weather, while others won’t. Don’t let the weather scare you, though. 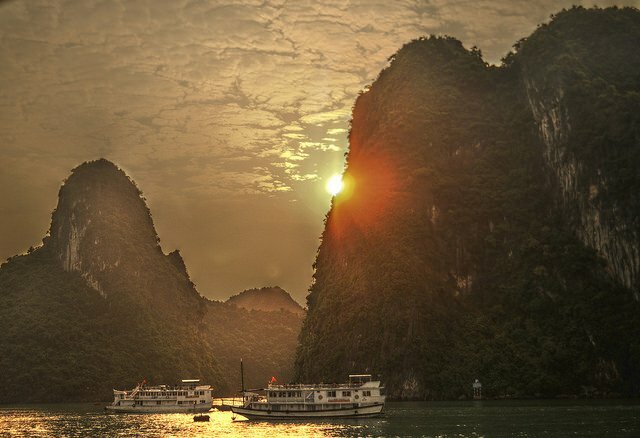 A trip to Halong Bay is a trip to one of the planet’s most unique and fascinating landscapes. 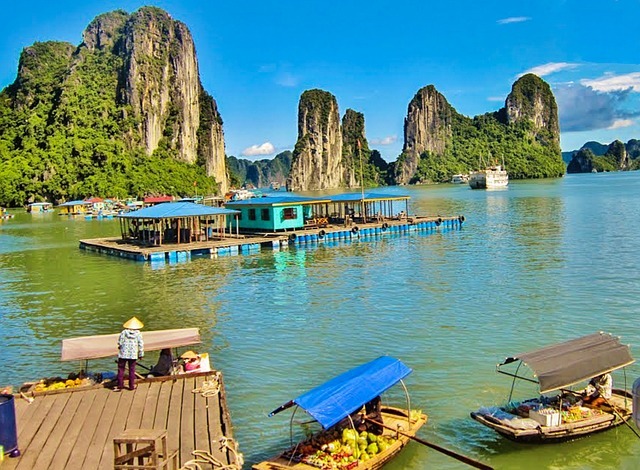 Whether you want to experience great kayaking, jungle hikes, and challenging climbs, or simply sit back on the deck of a boat and enjoy the unbelievable scenery, Halong Bay is an unforgettable place, and a great addition to anyone’s bucket list.